Discover your complete horoscope for March 2019! Life can be chaotic and random. We are notoriously uncomfortable with the unknown. 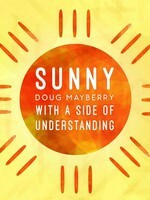 Our brains have evolved to filter out most of it, so what gets through are the threats, the changes, and the small things from which we are compelled to try to make order, to look for a pattern, to construct a narrative -- to make sense of the senseless. Holiday Mathis is trying, like we all are, to find the pattern. 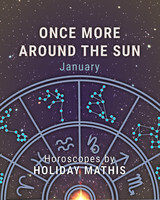 With her 15 years of experience in astrology and antiquity, Holiday peers through life’s lens, connecting the dots and extracting meaning that will help readers know that they are seen and understood, and that we all belong together in this cluster of humanity, multitudes beneath one sky. 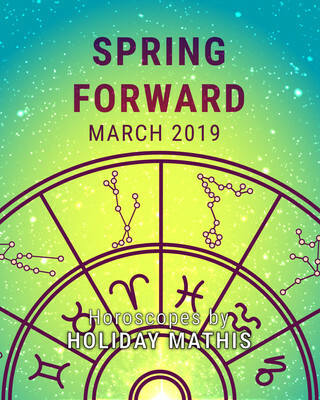 With short and sweet insights, “Spring Forward” serves to enlighten readers as to what to expect in their love lives, careers, health, relationships, financial futures and more this month.